What is imperative to a any online bingo site is quality service, excellent promotions and of course superb gaming. 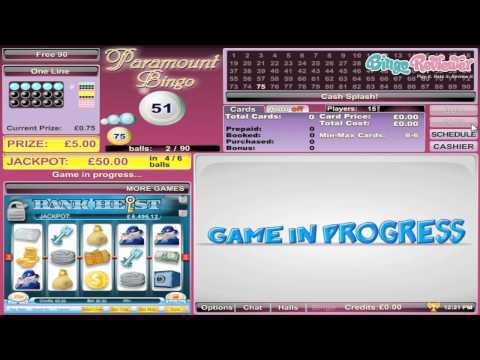 Paramount Bingo fits the description for everything a player is looking for with round the clock entertainment. The golden pot is brimming with gold coins and reflects a glimmer across the homepage. The possibilities are endless to fill your own personal pot with treasures as you view the prize money won from the month before. It’s staggering to think that over a million in cash has went out their lobby doors to players from all over the world. The News page highlights their biggest competitions where the prize packages are stupendous. Many of the contests here run over a course of a few months and the final countdown to the potential winners is a thrilling prospect. Making their way into the online bingo market in 2002, Paramount Bingo has excelled and persevered through tough competitors in the field. Their goal is simple; ensure the best possible experience to online bingo players. And it is a goal they have lived up to. They utilize Byworth software which means they have some of the best products offered on a platform of games designed specifically for the bingo player. As part of the Bingo Entertainment Network, players are assured of a reliable site. What makes this bingo site so special and stands apart from their competition? It’s a bingo world brimming with every variation of bingo that exists. That is a pretty amazing feat with 90 ball, 75 ball, 80 ball and 30 ball bingo under one bingo house. What more could any bingo fan ever ask for. But the gaming doesn’t stop there because there is more than bingo to play if you are a true gambler. That is why Paramount Bingo has added a slew of other compelling games to play. Slots offer 3 reel, 4 reel and 5 reel slots. The graphics are crisp and the spinning runs smoothly with out any unnecessary lags or delays while playing. If you’re in the mood for still more bingo but want to play outside the bingo rooms then Instant Bingo games are a perfect alternative. Here you will find Instant Bingo 30, 75, 80 and 90 games to play as well as Jingle in all the bingo variations. And no bingo would be complete unless there was Pull Tabs. The Casino is open and ready for some Blackjack, Caribbean Poker and Video Poker. Paramount Bingo has one smart marketing department. They know all to well that players like to try before they buy and so they offer a free bonus with no deposit required. Play and discover all the games they have to offer and pick your favorites with this No Deposit Bonus. The First Deposit Bonus is appropriately perfect for new players and a nice gift to have extra credits to play with. All other future deposits will be offered a Reload Bonus that is available every single day. All bingo variations offer fun promotions with an easy to follow schedule listing all the activities for the day. Free Bingo rooms are available for 90 ball and 75 ball bingo to earn some nice rewards. Chat Games and Tournaments are also highlighted specials. It couldn’t be easier to earn Loyalty Points at Paramount Bingo. Do what you do best, play, play and play and every wager will earn you valuable points that can be redeemed for nice playable bonuses. Having every possible variation of bingo available to players is a strong plus. Mega Bucks, SuperPots and Progressive Jackpots offer players a chance to win big. We rate Paramount Bingo with 4.45 Pink Hearts. Though Paramount Bingo won't let US players in at this time, I have played previously on Byworth software and so am already a little fond of this site from the first visit. I do like the 10 pound sign up bonus offer. You can play a lot of bingo games with that, and hopefully will get lucky and win a nice prize. You will find so many varieties of bingo games at Paramount Bingo that you'll never be lacking for entertainment. And if you do find yourself wandering elsewhere on sight you'll find even more bingo in the instant bingo versions of the game. Okay, so they also have a sweet set of slots games you can play as well as pull tabs and then there are all the games at the casino. With a good promotions department always coming up with fresh new reasons to play, and with nice deposit bonuses and an excellent loyalty system, you may find yourself coming back often to Paramount Bingo. It's been in business for awhile and still going strong. All that is missing is you, if you haven't yet joined. Good Luck! When you see a site called Paramount Bingo, it is hard not to expect a lot from it. At first, the site's design failed to impress me, and it looks kind of out of date, and I think they should do something about it, and fast. The look of it doesn't slow it down however, and I was a bit surprised how everything works smooth and speedy. To get you started, there's a £10 No Deposit Bonus, you just have to sign in to get it, and it is a good beginning allowing you to try the games before wagering and depositing. Bingo games are represented with the classic 75 and 90 ball games, but also with 80 ball games and my personal favorite 30 ball games. With 10 rooms in total (4 rooms for 75 and 90 ball and one room for 30 and 80 ball games). That's a good choice and There's little chance you will get bored any time soon. This is a very nice site. When you sign up, you will receive a pretty decent welcome offer. As a new player, you will get a £10 no deposit bonus. You might be thinking this doesn’t sound like very much but that’s not the end of their deals! On top of this, they will also reward you on your very first deposit to the site. They will give you a 350% match bonus on your first deposit up to £500. Plus, there is a 75% reload offer for all future deposits over £10 on every deposit you make. What I love most about Paramount Bingo are the options they have available when it comes to bingo. There are plenty of options up for grabs, including 30, 75, 80 and 90 ball. I usually run across sites that offer two, maybe three bingo variations. But this one offers four! If you love bingo, this is definitely the site for you! Support:24/7 by email, or online chat ! 30, 75, 80 and 90 ball bingo rooms!